RUPERT CHAN is a University administrator, freelance translator, playwright, writer, lyricist and radio host. He is Chairman of Directors of the Chung Ying Theatre Company and a Director of the Composers' and Authors' Society of Hong Kong (CASH). 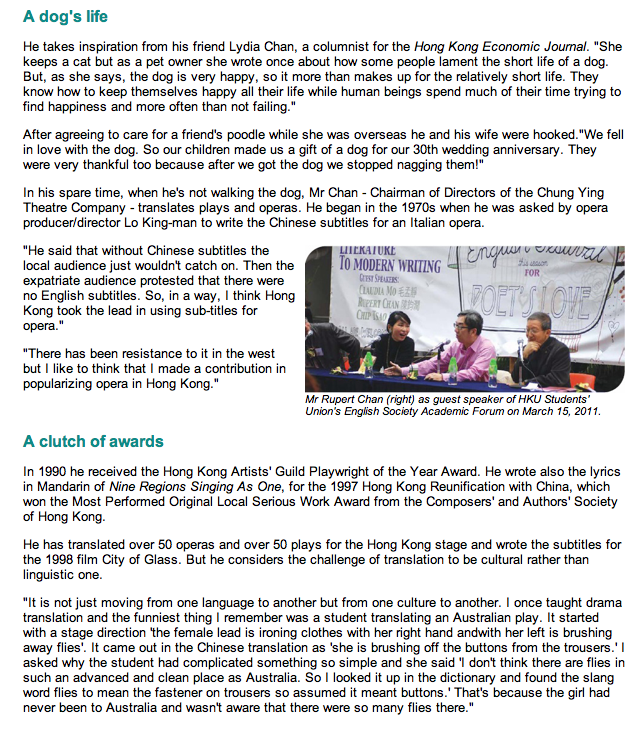 He has been an adviser on opera and drama to the Hong Kong Government's Leisure and Cultural Services Department. Chan received the Hong Kong Artists' Guild Playwright of the Year Award in 1990. He wrote the lyrics in Mandarin of Nine Regions Singing As One, composed by Professor Chan Wing-wah for the 1997 Hong Kong Reunification with China (sung by Warren Mok and Choir), which won the Most Performed Original Local Serious Work Award from the Composers' and Authors' Society of Hong Kong. He received the Home Affairs Bureau Certificate of Commendation for making outstanding achievements in the promotion of arts and culture in 2004. His fictional autobiography, Chocolate's Brown Study in the Bag, was a finalist for the inaugural Proverse Prize and was published by Proverse Hong Kong in March 2011. Rupert Chan, "Chocolate's Brown Study in the Bag" was mentioned by "Lydia" in the Hong Kong Economic Journal. Chinese. English translation. TALKS GIVEN BY RUPERT CHAN, RELATED TO "Chocolate's Brown Study in the Bag"
Read the text of the Talk Rupert Chan gave at the Proverse Hong Kong event, Hong Kong International Literary Festival, 2011: "﻿Chocolate's Brown Study in the Bag ﻿and Other Animals in Literature". Rupert Chan spoke at a mini book-fair, arranged by MCCM publications, at the former Central Police Station, Hong Kong, Saturday 14 May 2011. 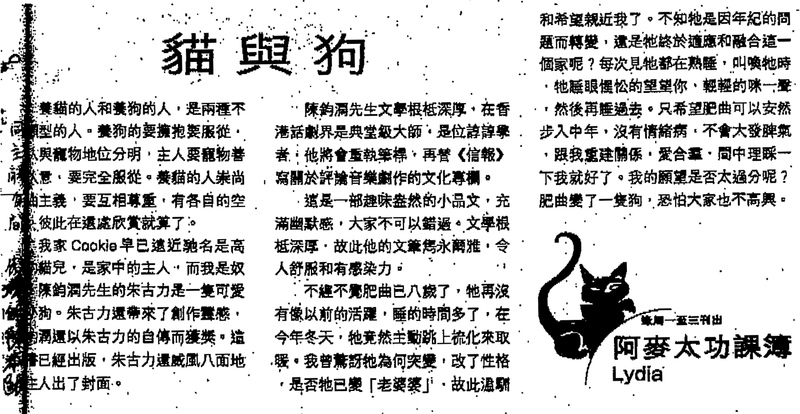 MEDIA MENTIONS OF RUPERT CHAN'S "Chocolate's Brown Study in the Bag"
The toy poodle, Chocolate, who dictated his memoirs, Chocolate's Brown Study in the Bag, "through transmission of brainwaves", to then senior University of Hong Kong Administrator, Rupert Chan, "who served as scribe", was given three pages in Ming Pao weekly on 'naturday', 26 November 2011. 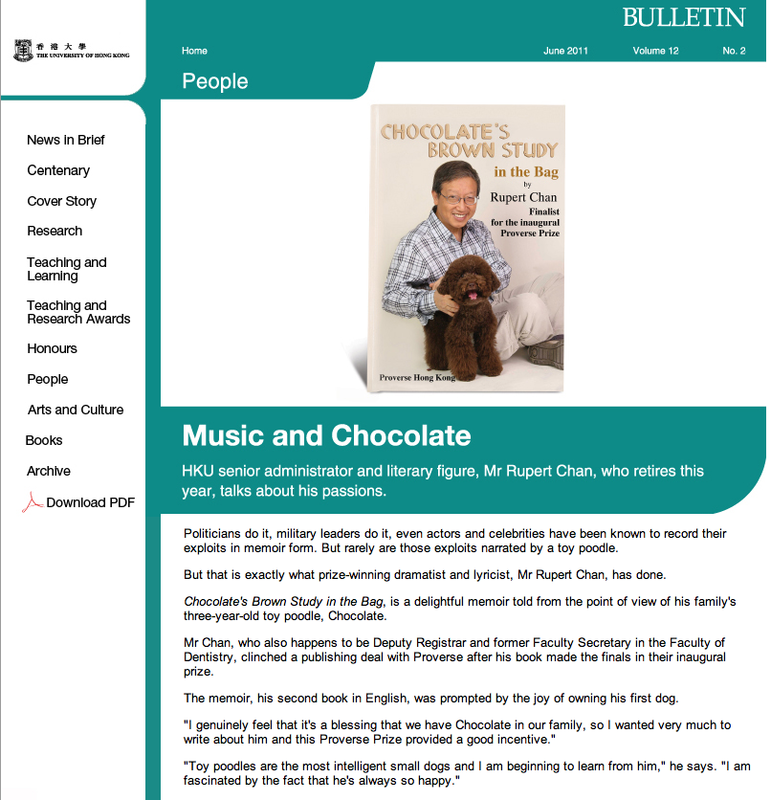 Some months previous to that, Rupert Chan gave a delightful interview, which appeared under the title, "Music and Chocolate", in the University of Hong Kong Bulletin, Vol. 12, No. 2, published in June 2011 (p. 24). Earlier than that, very soon after publication, Chocolate's Brown Study in the Bag was one of the subjects of Lydia Chan's column "Mrs Mak's Homework Exercise Book", in the Hong Kong Economic Journal, 28 March 2011. 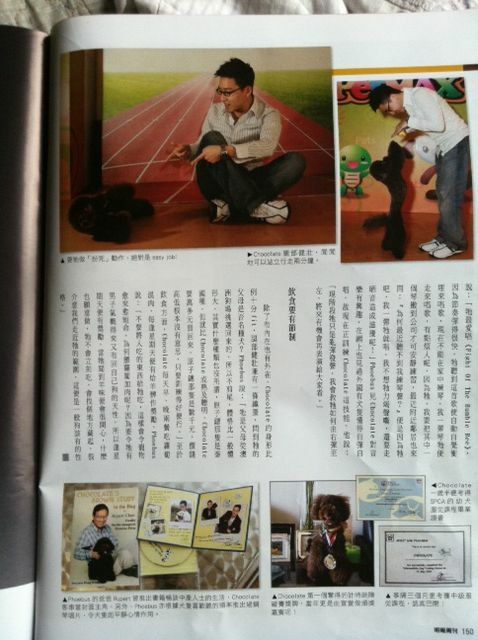 Ming Pao weekly, Saturday, 26 November 2011. Cutting. p. 1, p. 2, p. 3. ﻿﻿"Music and Chocolate", Interview in the University of Hong Kong Bulletin, Vol. 12, No. 2, published in June 2011, p. 1, p. 2, p. 3. 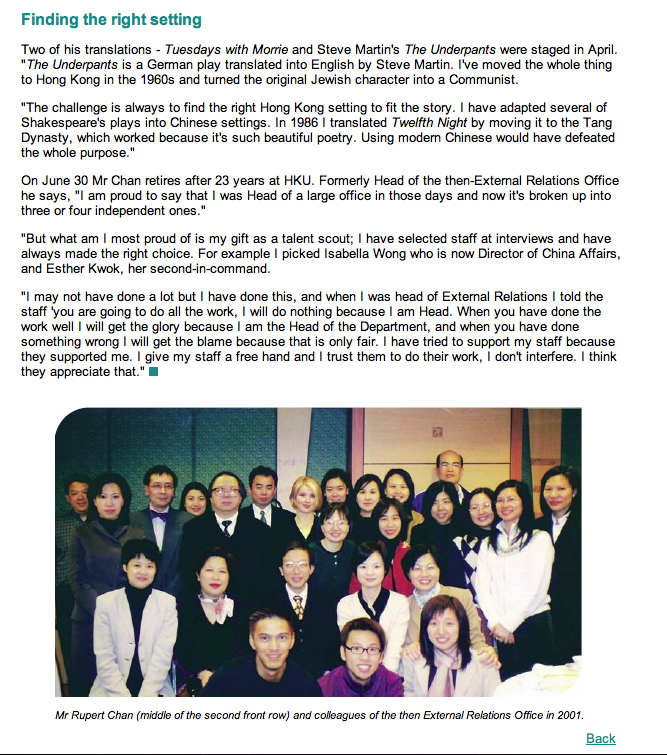 ﻿﻿﻿"Mrs Mak's Homework Exercise Book", in theHong Kong Economic Journal, 28 March 2011 (English Translation by Rupert Chan). Cutting (in Chinese). Chocolate, who transmitted his memoirs (Chocolate's Brown Study in the Bag, Proverse Prize Finalist, 2009) through brain-waves to Rupert Chan, who acted as scribe, has helped his family win another prize! They joined the SPCA pets walkathon in Disneyland HK and Mrs Chan won a Nikon camera with this photo taken that day. "Chocolate is really a winner!" Rupert Chan writes. See photo below.